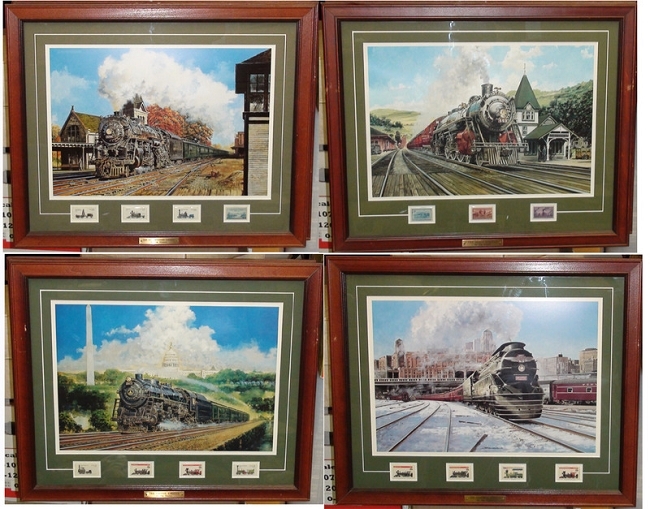 This Postal Commemorative Society complete Set of 4 framed Railroad Prints prints of by Jim Deneen each print originally sold mail order by the PCS for $117 + postage back in early 2000. 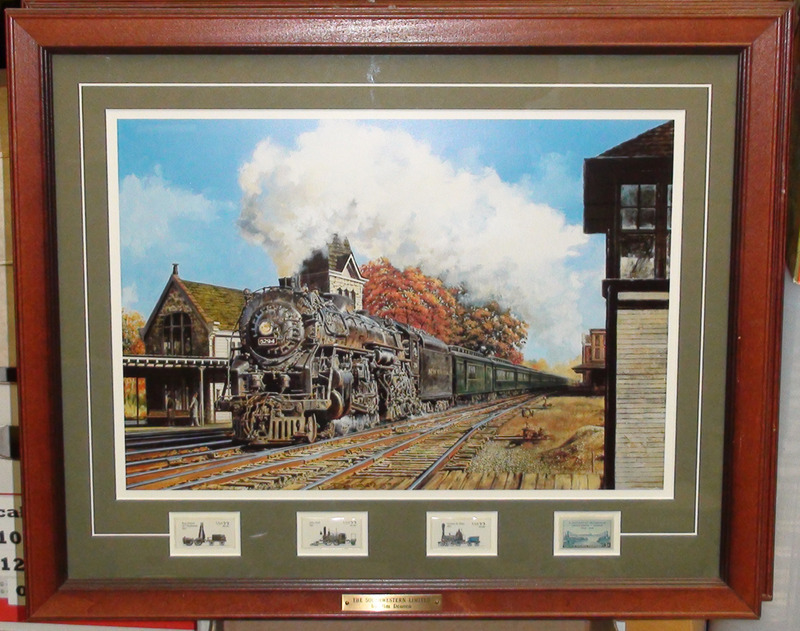 Each framed print is handsomely matted and surrounded by a very nice wooden frame. A notice on the backing indicates that ?Conservation framing techniques and archival quality acid free materials were used to assure its longevity and permanence.? Each print is ready to hang and be enjoyed. The print measures11-1/2 by 16-1/2 and the frame edge to edge measures 18 inches by 22 inches. This print comes with 3 stamps which are also matted and together make a beautiful piece for any decor. The Stamps are not postmarked and appear to be very old because they are 3 cent stamps. The first stamp says The Baltimore and Ohio Railroad chartered Feb 28, 1827 , 125 years of rail transportation, a 1952 stamp. 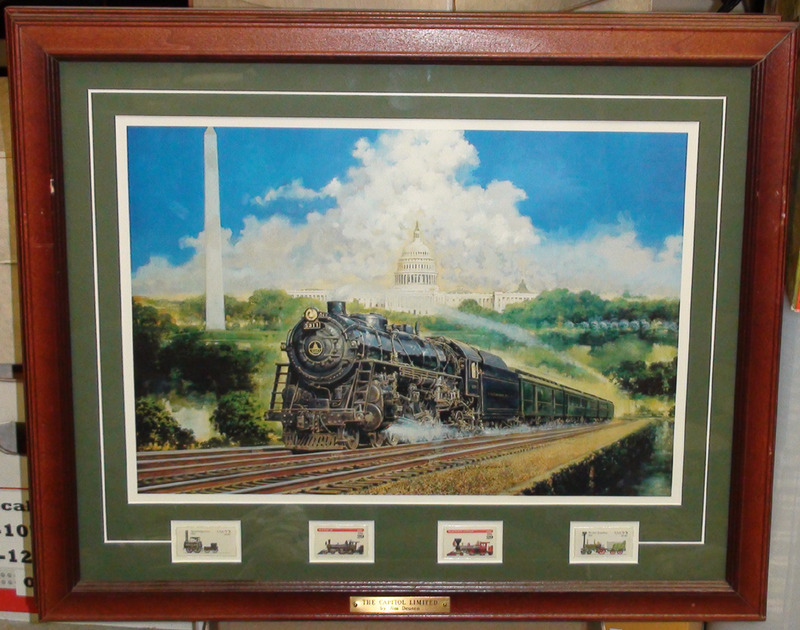 The stamp on the far right is from 1944 depicting completion of the Transcontinental Railroad. The middle stamp also 3 cents honors railroad engineers of America, no date. This print comes with 4 stamps which are also matted and together make a beautiful piece for any decor. Three of the stamps are 22 cent stamps depicting rail cars from the 1800's. The fourth stamp is a 3 cent stamp noting "A Century of friendship" US - Canada (1848-1948).. This print comes with 4 stamps which are also matted and together make a beautiful piece for any decor. Ready to hang and ready to be enjoyed. 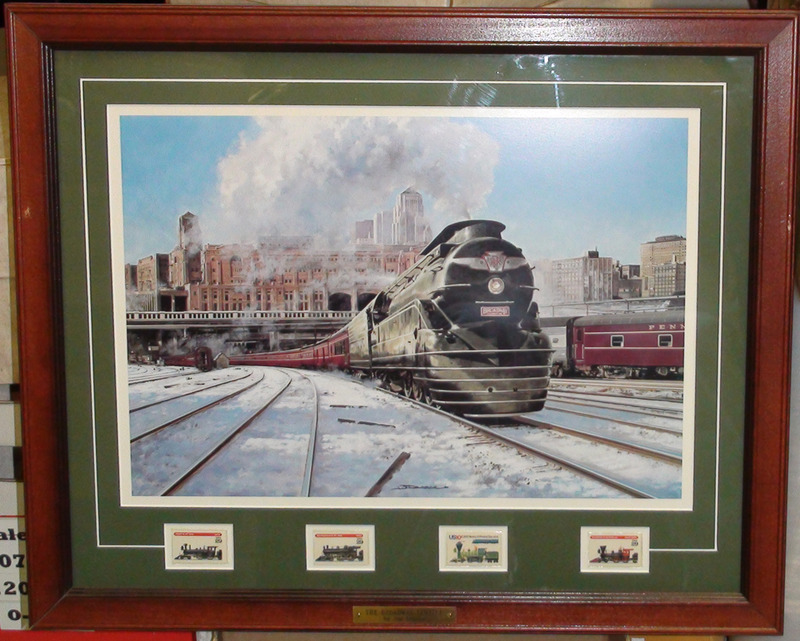 Two of the stamps are 29 cent stamps depicting Eddy, Buchanan & Hudson rail cars from the 1800's. The fourth stamp is a 10 cent stamp noting "200 Years of Postal Service.?? This print comes with 4 stamps which are also matted and together make a beautiful piece for any decor. 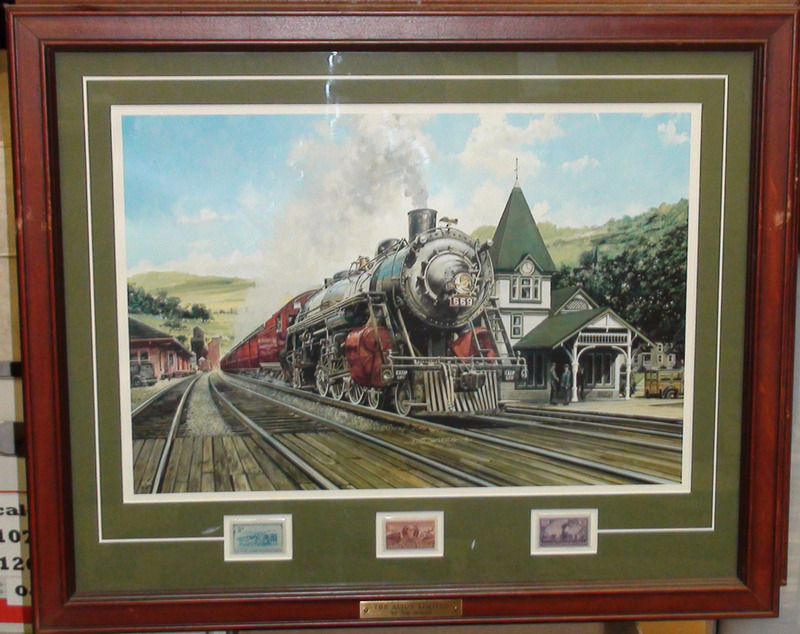 Three of the stamps are 29 cent stamps depicting Ely & McQueen Locomotives from the 1800's. The third stamp is a 22 cent Stourbridge Lion 1829 stamp and the fourth stamp is 22 cent Brother Jonathan 1832. 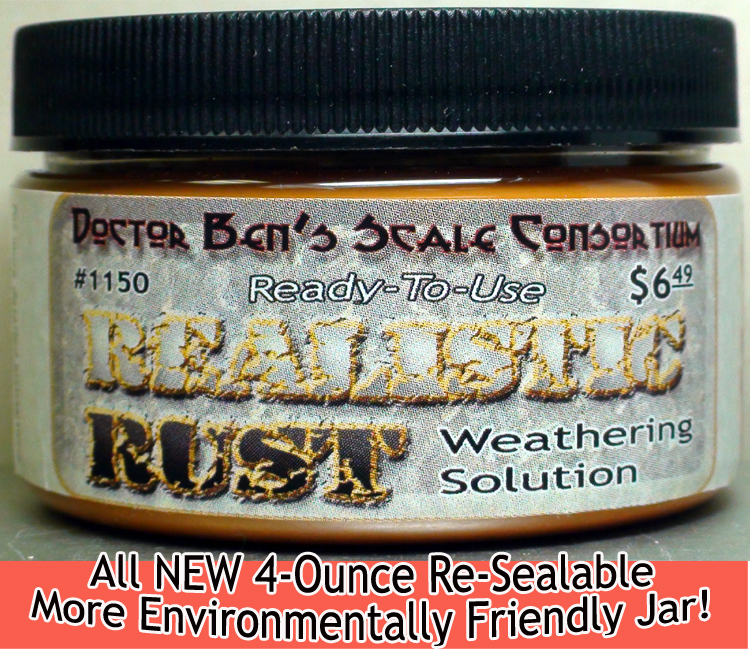 Weathering Stain Set #1-FloquilStain Colors-New! Doctor Ben's Baby Building Blocs Multiple Colors to Choose! 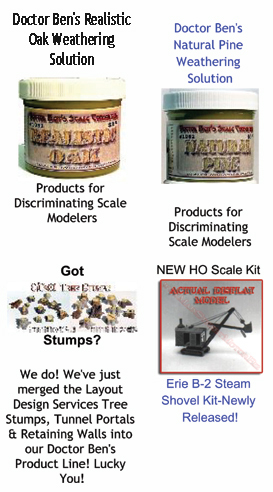 ALL NEW 27-Color Armour & Railroad Pigment Sets! 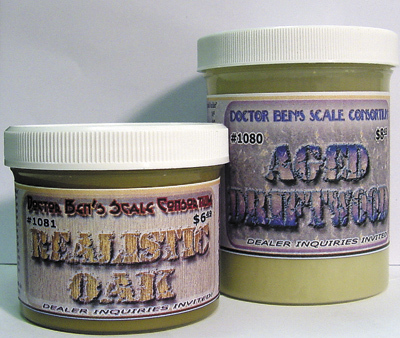 *NEW* 11-Color Pigment Sampler Sets! We are always looking forward to hearing original ideas & feedback from our friends & customers who have enjoyed using our products. Got a story to share, or am image that you are especially proud of? Send them in, we have thought that we should have more User photos. As always we are happy to return your requested material to you.